A few weeks ago, I showed you a metal toolbox that I had purchased at an estate sale....In case you don't remember, here it is again. I thought that it would be different to make it a real decorative statement, rather than just a plain, ordinary toolbox. Since the metal was chipped and potentially rusty, I coated the entire piece inside and out with a satin varnish. I wanted to leave the metal hardware as it was and also wanted to maintain some of the places where the paint had chipped away exposing the metal. To do this, I coated anywhere that I wanted unpainted with a coating of Vaseline. When you paint over the Vaseline, it doesn't stick and when you are finished with the project, the paint will sand or wipe right off. And believe it or not, it does not get brushed onto areas that you didn't want it to while you are painting! You should know, though, that it can be a little messy and the paint will come off onto your hands while you're trying to paint, but it is a whole lot easier than trying to NOT get paint on an area or sanding it off afterwards. After coating the toolbox in places with the Vaseline, I followed up the coat of varnish with a coat of KILZ paint to protect it from staining. Over the KILZ, I painted two coats of yellow chalk paint. After the first, I realized that the yellow I showed you the other day (in my post about making chalk paint) was way too light. I don't know whether it was because I was painting over the white coat of paint or if it is just a light yellow color, but it was no where near the color I wanted. So, I played around with adding three extra colors (Burnt Umber, Golden Brown, and Empire Gold - All from Ceramcoat) that I had in acrylic to it. Instead of adding the acrylics to the bottle of paint and risk messing up the entire jar, I squeezed some of each color onto a paper plate and brushed it directly onto the toolbox after coating a section with the chalk paint. It took a little work to get a matching color on the entire piece, but in the end I love how it turned out. 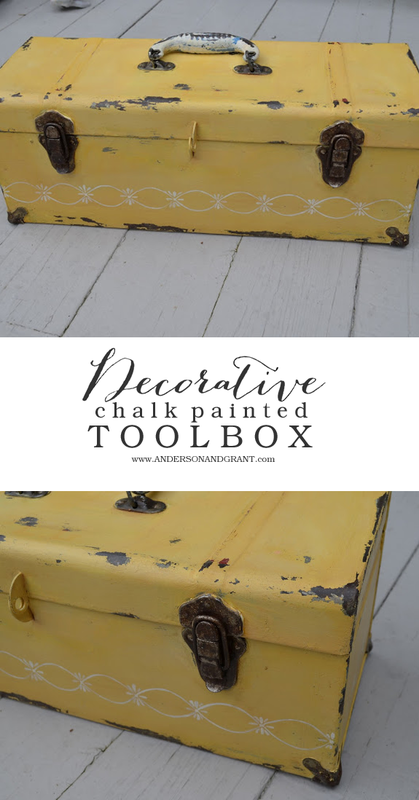 After the toolbox was finally the golden yellow I was looking for, I added a decorative painted detail around the box with white paint and a liner brush. Then I wiped away the paint on the metal hardware and made the edges look chipped. The entire piece was sealed with another coat of satin varnish. Then I brushed burnt umber paint on it and wiped it off with a damp rag to give the toolbox an antiqued look. The job was not done, though, because I decided I wanted to decoupage the inside with pages from an old Reader's Digest book using Mod Podge. I painted the tray that was inside the toolbox with an antique white chalk paint following all the same steps as above. Now I think the toolbox can serve as a great storage piece or to display treasures. I think the tray has so many uses on it's own. Or it could be used on a desk to hold office supplies. You could also use it in the kitchen to hold spices or utensils. I hope this project inspires you to repurpose an item that you have lying around! Monday I will have another item to show you from that Estate Sale Trip.